Charge Your Holidays To UOB Cards To Redeem At NATAS 2018! NATAS is here again and the deals keep getting better with UOB Cards and redeem your free luggage and/or expandable and foldable duffel bag. Ready to snag the best travel deals for your next vacation? Hurry down to NATAS 2018 at Singapore Expo, Halls 3B & 4, from 17 - 19 August 2018. 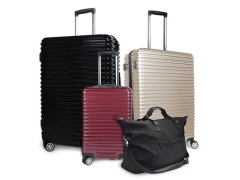 UOB Cardmembers can redeem free luggage and duffel bags when you charge your holidays to any UOB Card. Visit our booth B05 during the fair! Click through for incredible deals!